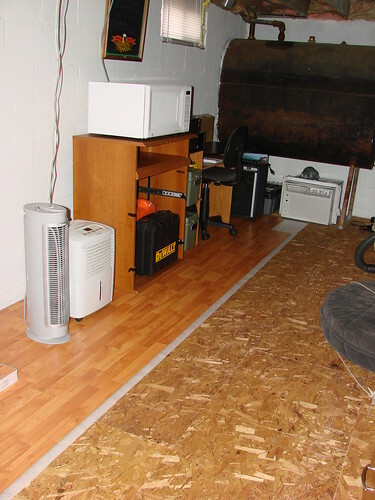 this weekend we undertook one of our summer projects- the basement floor. we were not planning on taking this monumental project on until later in the season, however lowes had a promotion this weekend- $10 off $50 per transaction, which translates into 20% off. the catch is per transaction- we quickly figured out that we could place online orders for store pick up in $50.00 increments to take advantage of the weekend deal. we totaly scored on this project. then we start to think. that is where the real trouble begins- hmmm, we have this nice new floating floor, we can't just have a bare floor. so we check out laminate. we have low ceilings so we need to be aware of adding additional inches; laminate is the thinnest & they have come a long way in quality- i was quite impressed. 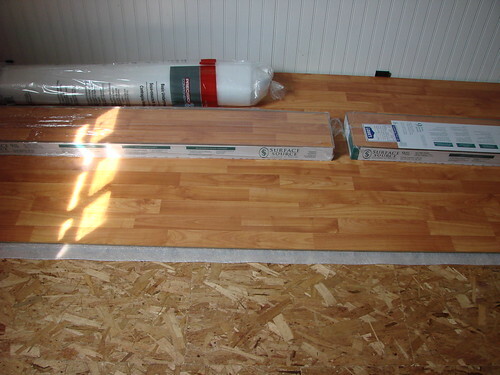 so we picked out the flooring, a nice cherry finish. the brand we selected was on sale and recieved great consumer reviews. okay new dricore sub floor, new laminate. 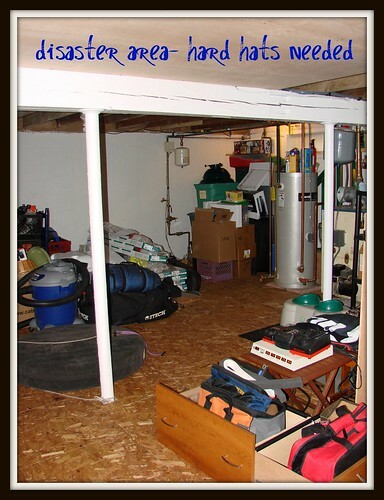 we start to look around the basement thinking what else would benefit from a makeover. with beautifully finished floors we can't possibly have beaten up wooden stairs leading into the basement. did i mention said stairs are painted a pine green- with brown 1960's carpet squares. so we are painting the stairs white and purchasing a runner for the steps. i convinced justin to put me in charge of the painting portion so he could focus on finishing up the flooring. next thing i know justin is running up the stairs to ask me what i think of our current storage area . justin built this monster unit out of reclaimed wood- yes it did the job for the past 2 years, but it doesn't quite fit with our soon to be newly renovated space. so the monster unit is now disassembled- aka firewood. welcome new stainless steel wall organizing unit- classy. i love when we are on the same page- he doesn't know i had been thinking this same this earlier in the day, but did not mention it as he was pretty proud of his creation. we still have a few more projects on the list for the basement- justin has planned a utility closet to hide our water heater and boiler; this will also provide us with additional storage. we still have to finish insulating and hanging wainscoting on the walls- this can be done section by section along with the ceiling and lighting, so no rush here. once completed it will be a beautiful & functional space- hardly recognizable as a basement. I can recommend you really great essay writing service if you need to write an essay soon. It was really helpful for me and my friends in college.